I had bought some wreath shaped pretzels to use for my Rolo Turtles not realizing the Rolos would fall through the wreath. I used one bag of the wreath pretzels for my cinnamon sugar pretzels. Since I had another bag to use up, I found this recipe. Hubby had leftover popcorn oil from an event he hosted in November so this was a perfect way to use the pretzels. Enjoy these at your Christmas get together or even on New Year’s Eve. Yum! Oh and the best part of this is there is no baking involved. Sweet! Pour the pretzels into a deep dish. In a separate bowl, mix together the oil and seasonings. Pour over the pretzels. Stir until all of the pretzels are combined. Sprinkle the Parmesan cheese. Stir once again until the pretzels are combined. Continue stirring every 15 minutes or so for 3 hours or until the oil is absorbed by the pretzels. During the Christmas season, I enjoy finding new recipes to try. So when I saw the recipe for Old Fashioned Sugar Cookies, I knew I needed to try them. I’ve begun my Christmas Making and Baking 2016. When I found this recipe, I decided to make it since it looked so simple to put together. While I was waiting to put the white drizzle on the pretzels the Wee One wandered into the kitchen. He decided he needed to taste the pretzels. The Wee One told me how much he loved the taste of the pretzels. He helped me put the drizzle on top of the pretzels. When I was packing up the pretzels, we put the pretzels into two containers. One was for later and the other was for he and his brother to snack on. Later on in the day, we made another two batches of cinnamon sugar pretzels for a cookie/ treat exchange Hubby was going to attend. The Wee One helped me with making those two batches. He told me that he wanted to know how to make cinnamon sugar pretzels. The Wee One enjoyed making the cinnamon sugar pretzels. 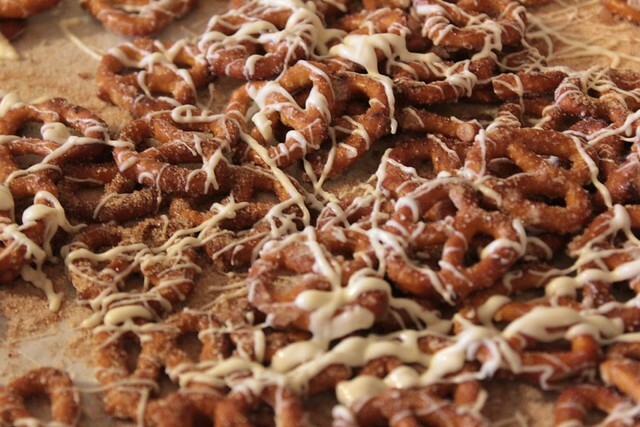 The cinnamon sugar pretzels are easy to put together. When we did the white chocolate DRIZZLE, we used a baby spoon to do the drizzle. Prepare two cookie sheets by covering them with parchment or wax paper. In a large mixing bowl, whisk together the oil, sugar, and cinnamon. Stir until all the pretzels are coated. Microwave for 1 minute. Stir. Microwave for 2 more minutes. Stir. Divide them between the two cookie sheets. Make sure the pretzels are in a single layer. Drizzle the white chocolate over the pretzels. I’m finishing up my Christmas making and baking. My mom called me last night to tell me that she was going to come over to our house for Christmas. It’s been many years since she’s been at our house for Christmas so it was a nice surprise. The one thing she’s asked for was homemade goodies. I’m almost finished with the Christmas making and baking. There is a few goodies left to make. This eggnog bread was one of those things. It’s easy to put together and makes a lot. Grease mini loaf pans (5). Add sugar, eggnog, butter, rum extract, and vanilla extract. Mix until combined. Add the flour mixture to the batter. Mix well. Add the instant vanilla pudding. I bought some eggnog to make eggnog bread. Since I had some of the eggnog left, I decided to find a recipe to make eggnog doughnuts. This recipe is moist and delicious. It paired well with my coffee flavored with my peppermint mocha creamer. It would also be delicious with my eggnog creamer. I made these many years ago. This year I decided to make them once again. Add vanilla and milk. Beat until combined. Add flour, 1/2 c. at a time. Mix until incorporated. Divide the dough in half. Form each half into a 8 or 9 inch log. Roll each half in coconut. Wrap in parchment paper or plastic wrap. Freeze for at least 30 minutes. Slice in 1/4 inch cookies. Place on baking sheets. Bake for 375 degrees for 8 to 10 minutes. I froze mine overnight and then pulled them out of the freezer for 15 or so minutes before slicing them. I’m enjoying making new creamers now that I got the ratio of milk/ half & half/ or heavy whipping cream to condensed milk. This creamer needs to be warmed up so that the cocoa is dissolved. I ended up having to strain the non dissolved cocoa so there isn’t any lumps left in it. As you can see from my pictures, some of the cocoa did not dissolve.